Biodiesel has been considered as the potential fuel type with many advantages such as environmental pollution reduction, no sulfur production, and biodegradation. However, disadvantages of biodiesel such as high viscosity and high density affected diesel engines and fuel systems negatively. Thus, it is necessary to reduce the viscosity and density of biodiesel fuel in unmodified diesel engines. Until now, a large number of empirical correlations have been used to predict the viscosity and density of biodiesel–fossil diesel fuel blend This study was conducted to predict the kinematic viscosity and density of blends of biodiesel and fossil diesel fuel. Three types of biodiesel were examined: Coconut oil-based biodiesel (COB), Jatropha oil-based biodiesel (JOB), and Waste oil-based biodiesel (WOB). Twenty-four samples of the three types of biodiesel–diesel fuel blends were created by blending 5% (B5), 10% (B10), 20% (B20), 40% (B40), 50% (B50), 60% (B60), 75% (B75), and 100% (B100) of biodiesel with conventional diesel fuel to produce the corresponding blends for experimental purposes. 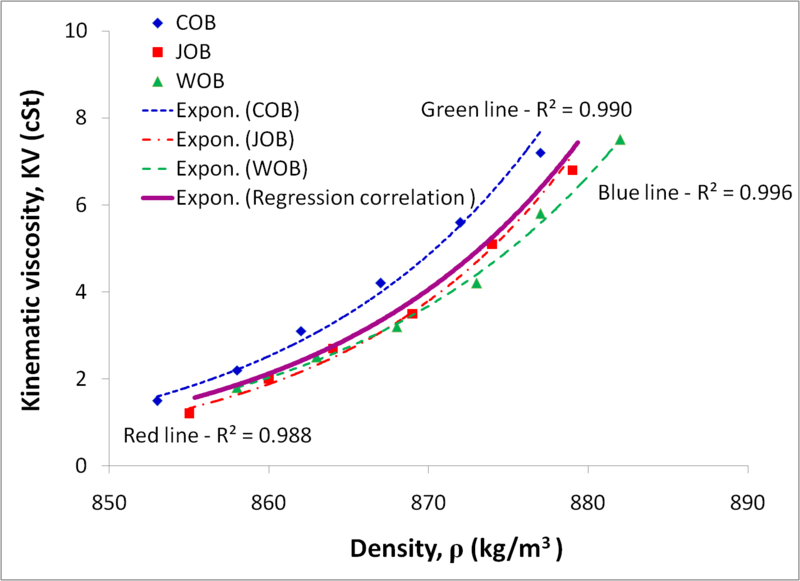 Experimental correlations and mathematical equations for predicting the relationship between the kinematic viscosity and the density of the biodiesel–fossil diesel fuel blends, the dependence of the kinematic viscosity and the density of the biodiesel–fossil diesel fuel blends on biodiesel fractions, and the effects of temperature on the kinematic viscosity and density of pure biodiesel were developed. The results of the experimental correlation data were near the predicted mathematical equation with a confidence level of 95%. The density and kinematic viscosity of pure biodiesel were inversely proportional to temperature, whereas the density and kinematic viscosity of biodiesel–diesel fuel blend increased as the volume fractions of the biodiesel increased. Empirical equations with high confidence levels were established. The results showed R2 = 0.9979 in predicting the dependence of the density of pure biodiesel on temperature and R2 = 0.9844 in predicting the dependence of the density of biodiesel–diesel fuel blends on volume fractions. Similarly, the results showed R2 = 0.9942 and R2 = 0.9957 in predicting kinematic viscosity. In the experimental results and the model, the relationship between density and kinematic viscosity was R2 = 0.9961.